During the hunt for memorable recipes passed on by mums, we came across a particularly candid recipe by Megan Hutton for her mum’s ‘revolting chocolate cake’. Revolting, because you loose all self-discipline. The proof for this one is definitely in the pudding. 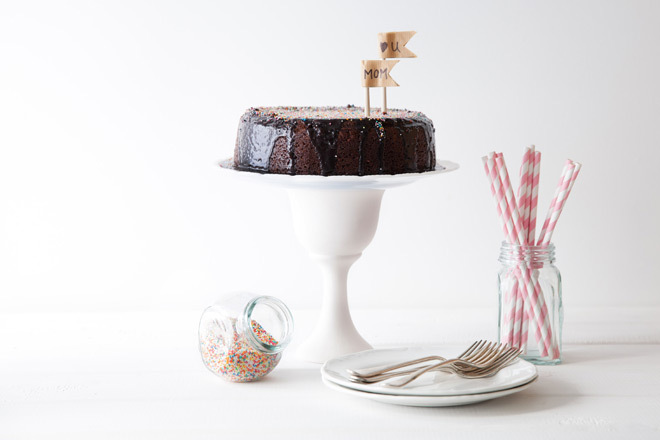 Here’s her recipe for a simple and delicious chocolate cake and Megan’s lovely story. ‘I am 27 years old and ever since I can remember my mom has made me “revolting chocolate cake” for my birthday. Why is it called revolting chocolate cake you may ask? Who would want to eat something if it’s so revolting? Well, it is so aptly named as it is so incredibly, delectably delicious that you would want to carry on eating it until you feel absolutely revolting. What makes it truly delicious is that it is made with oil and buttermilk and is therefore so moist, it’s almost like eating chocolate pudding. The special “icing” or should we rather say “chocolate sauce” makes it even more divine because it’s poured over hot so that it can soak into the cake and make it even more scrumptious. I actually made it for a dinner party not too long ago and instead of making a full cake I made smaller muffins with the chocolate sauce on the side to pour over. It was amazing. And so easy to make! It’s also yummy if you add cream to the mix but shhhh let’s not be too naughty now. 1. Preheat the oven to 180ºC. Then boil the margarine or butter, oil and water in a pot on the stove. 2. Sieve the dry ingredients into a bowl, mix them together and add them to the hot mixture. 3. Add the 2 beaten eggs, 1/2 cup buttermilk and vanilla essence. 4. Mix well and pour into a sandwich tin or cake tin (we used a 19.5cm tin). Bake at 180ºC for 40 minutes. 5. To make the hot chocolate sauce icing, boil the margarine, cocoa and milk. Add the rest of the sauce ingredients and mix well. 6. Once the cake comes out of the oven, pour your hot chocolate sauce over while the cake is still warm. 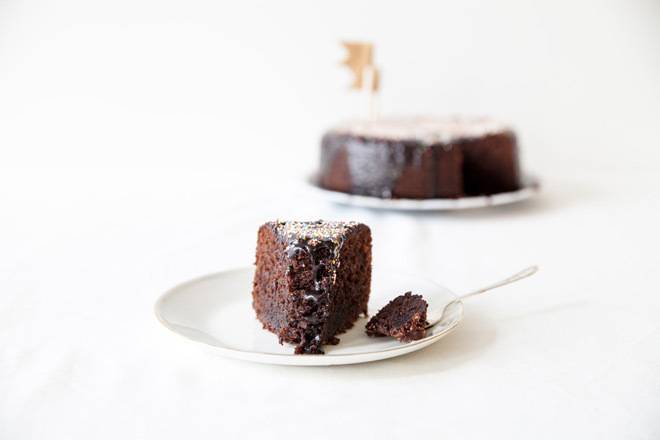 This cake went down a real treat, consumed with beady eyes of delight by everyone here at Yuppiechef HQ, so a big thank you to Megan Hutton and her mum for sharing their dark and delicious recipe for chocolate cake. For some more delicious recipes passed down from mums to daughters, head this way. With thanks to Sybil Doms for baking these classics in our kitchen.